Pre-zippered pouches have been gaining market on account of rising packaged food industry. The increasing use of food storing in pre-zippered pouches for residential as well as commercial storing is propelling the pre-zippered pouches market robustly. These pre-zippered pouches are available in stand-up pouch, 3 or 4-sided seal pouch, thermoform pouch, pillow pouch forms for consumer ease. Pre-zippered packages are made of packaging films such as, plastic, aluminum and others equipped with enclosable transverse zippers. The relatively easy handling of pre-zipped pouches over conventional packages with similar product designing has attracted significant appeal to food and cosmetic manufacturers. Application of pre-zippered pouches can be brought for both barrier as well as non-barrier packaging. Pre-zippered pouches market is anticipated to record a CAGR of 5.3% over the forecast period. Many multi-national companies are concentrating towards new product advances in pre-zippered pouches. Moreover, the many advantageous properties of pre-zippered pouches are exploited in the field of food and cosmetics now and then. New uses for pre-zippered pouches are discovered for household use on regular basis which is expected to drive the pre-zippered pouches market rapidly. Currently the global pre-zippered pouches market is observing vibrant growth on account of increasing demand of moisture free household food storages in the market. Advances in packaging industry in the past few years and growing technological explorations are projected to drive pre-zippered pouches market besides the wide range of functions of pre-zippered pouches in an immense range of products packaging such as cookies, pet foods, confections, snacks, rice, popcorn, IQF poultry and frozen vegetables during the forecast period. On the basis of regional platform, global Pre-zippered Pouches market is segmented into five major regions including North America, Europe, Asia Pacific, Latin America and Middle East & Africa region. The rising demand for pre-zippered pouches for various processes in chemical handling, food, cosmetics, and other industries are expected to drive the market rapidly over the forecast period. The growing R&D activity associated to pre-zippered pouches is further expected to increase the market growth owing to the discovery of new applications and designs of it. 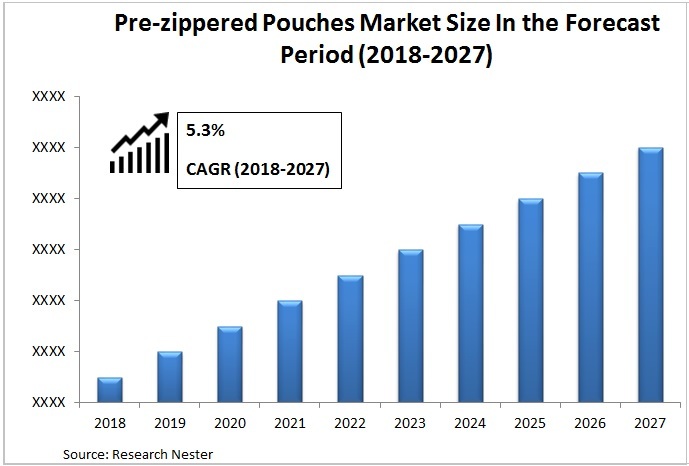 Rapid urbanization with increasing economic development and rise in disposable income is expected to boost the pre-zippered pouches market in the developed as well as developing regions of the world. Pre-zippered packages are economically more sustainable and advantageous for the storage of food products when compared to conventional packages. Moreover, features offered by pre-zippered pouches for instance, easy opening, portability and re-closing ability is estimated to propel the pre-zippered pouches market decently. Pre-zippered pouches provide enhanced user experience and prolonged and sustainable content storage. Pre-zippered pouches is an ideal way out for companies planning on shifting from traditional to re-closable packaging using pre-zippered film without requiring much long lag times and heavy expenses. Other flexible roll stock equipment can be used for the purpose of manufacturing pre-zippered pouches. The property of pre-zippered pouches providing water barrier as well as prevents entry of moisture that can harm the product inside is estimated to contribute significantly the pre-zippered pouches market for household applications. However, pre-zippered pouches prevent films from rolling tightly due to added bulk which is not the case in conventional packaging. Furthermore, increasing regulatory constraints regarding the usage of plastic as a packaging material and increasing initiative to use recyclable packaging materials is anticipated to serve as a major restraint in the growth of the pre-zippered pouches market over the forecast period across the environmentally concerned regions.